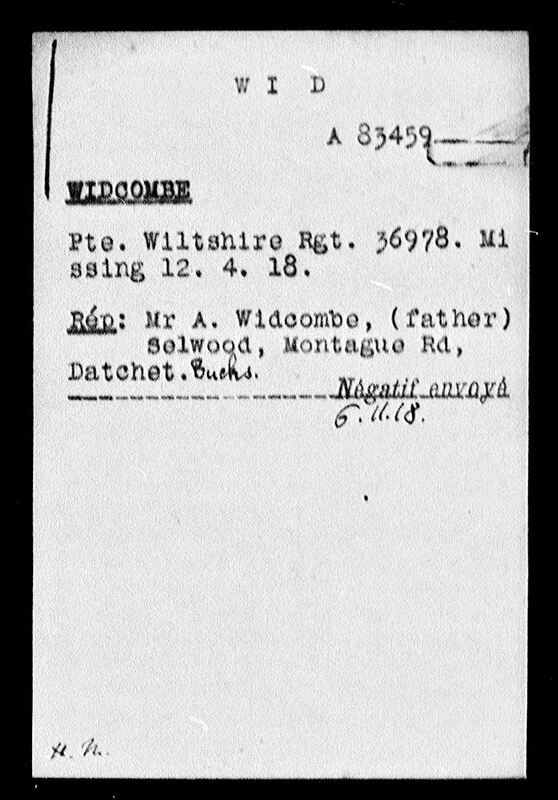 Arthur James Widcombe was born in Datchet in late 1898. He was baptised here on 21 December 1898 and named after his father, Arthur Charles Widcombe (1868-1942), a coal merchant. His mother was Agnes Mary Bridgman (1873-1954), a carpenter’s daughter from Maidenhead. Her family had moved to Cookham (1881 census) and then to Walthamstow in London (1891 census). She married Arthur in March 1897 at Christ Church, Marylebone, London. At the time, Arthur was already living at Selwood Cottage in Montagu Road, while Agnes was living at 12 Stafford Street, off Old Bond Street in London’s Mayfair, which suggests she was working in service. Arthur’s parents remained at Selwood for the rest of their lives. Arthur and his elder sister Elizabeth Mary (1897-1963) were born there. It was a large, semi-detached house – the 1911 census records that it had eight rooms, and the family also had a servant. Arthur’s family were in the coal business. His father and Uncle Harry (William Harris Widcombe) had taken over the business set up by his grandfather, Charles Widcombe. Charles had started out as coal miner, like his father before him, and had progressed to become a foreman on a coal wharf, then a coal building goods agent. By 1881 Charles was running his own business as a coal merchant in Datchet, based at the Railway Station. He employed seven men and was living at Clifton Villa on Horton Road. Arthur was educated at Windsor County Boys’ School 1908-1915. The school was founded in 1908 so he must have been there in its opening year. Most of the boys who had attended the school in its early years also served in WWI. After 1918 when a new house system was set up at the school, the houses were named after some of those who had lost their lives in the war. We know from later newspaper reports that Arthur was close friends with some other boys in the village, all were about the same age and only sons. They were James Hale Pearce who lived in Buccleuch Road and was a close neighbour of Arthur’s cousin, Charles (his uncle Harry’s son); and Sidney Walter Burfoot of the London Regiment whose family ran a boat hire business at the riverside. 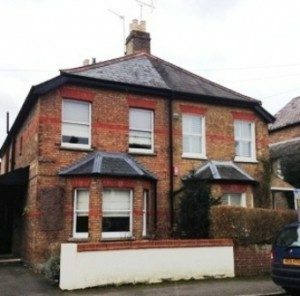 Sidney also lived in Montagu Road, at number 32, and it was a short cut from his house through the boat yard (now a Porsche garage) down to the river. All three were killed in WWI, as was Arthur’s cousin, (Uncle Harry’s son), Charles Ingleton Widcombe. Arthur enlisted at Slough in the 1st Battalion Duke of Edinburgh’s Wiltshire Regiment. We do not have the exact date he enlisted but it was perhaps in late 1916 when he was 18. 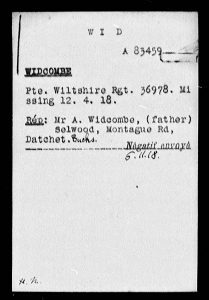 Arthur joined the 1st Wiltshire Regiment as Private 36978. The 1st was under the command of the 7th Brigade, and from October 1915 until June 1918 was with the 25th Division. “1917: The 1st Battalion started the year in the area of Ploegsteert, being relieved mid-January for a fortnight’s hard training. In February they carried out a daring daylight raid in conjunction with the 10th Cheshire’s. In late February they were relieved by New Zealand units, spending the next seven weeks in training. This was required due the reorganisation of all battalions whereby each platoon became self-sufficient in terms of weapon capabilities. The Army was starting to move towards mobile tactics. In April they took over some trenches from the Australians near Plogsteert. They went in and out of the lines until 7 June when the battalion took part in the attack on Messines Ridge. Two days later, after hard fighting, they had taken 148 prisoners and 7 machine guns, but had sustained 170 casualties. This was a significant action because in taking this high ground it improved the situation in the Ypres salient, which had been overlooked by the Germans for most of the war. In July they moved to Ypres and had their first taste of mustard gas. At the end of July they took part in the attack on Westhoek Ridge remaining in the area under heavy shell fire until 5 August. After a short rest they returned to the Ridge to support other units under pressure from the Germans. On 10 September, they moved south to join the First Army moving into the Givenchy Sector, near Bethune where they took up a position in October remaining for two months. At the beginning of December they were transferred once again, this time to the Third Army, to the Lagnicourt Sector near Bapaume. They were at this location at the end of 1917. “11 April, Trenches East of Ploegsteert Wood: Hostile artillery bombarded the Battalion’s position during the whole day. Owing to the enemy capturing the Catacombs and Ploegsteert Wood, the battalion was forced to withdraw to vicinity of Ravelsberg. Casualties OR (ordinary ranks) 1 killed, 5 wounded. Arthur was among the missing, later confirmed killed in action. Arthur was buried at Strand Military Cemetery, Hainaut, Belgium. 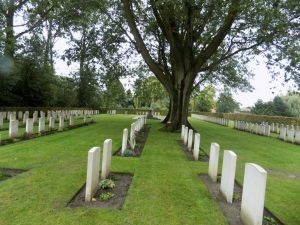 The cemetery took its name from a trench called the Strand which led into Ploegsteert Wood. (A point at the end of this trench was nicknamed Charing Cross by the troops.) Arthur was buried in plot X, one of the plots made after the Armistice. 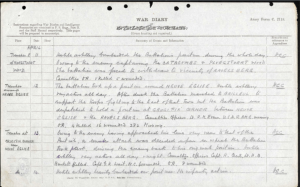 A grave reference is given – plot X, row B, grave 4 – but the burial records held by the Commonwealth War Graves Commision suggest that Arthur was originally buried as an unknown soldier and only later identified. The records state: ‘Buried near this spot’. His parents chose an inscription for his headstone: ‘He still lives in the hearts of those who loved him’. There are now 1,143 Commonwealth servicemen of the WWI buried or commemorated in this cemetery, 354 of the burials are still unidentified but there are special memorials to six casualties known or believed to be buried among them, and to 13 whose graves were destroyed by shell fire. Arthur was awarded the Victory and British War Medals. 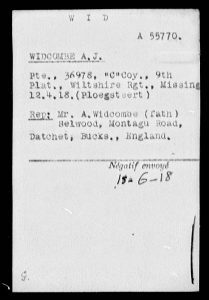 Arthur was reported missing in the Windsor & Eton Express on 11 May 1918. It wasn’t until November that year that the newspaper confirmed he had been killed in action. The International Red Cross holds records, below, which show that Arthur’s father was trying to trace news of his son’s whereabouts. The Red Cross responded in June and then again in November to say they had no record of Arthur. 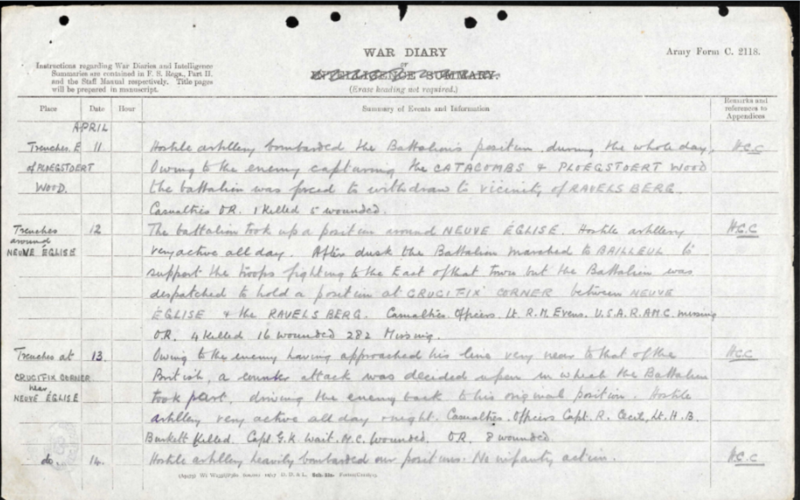 These records provide additional information; Arthur was with C Company, 9th Platoon, of the 1st Wiltshire Regiment. 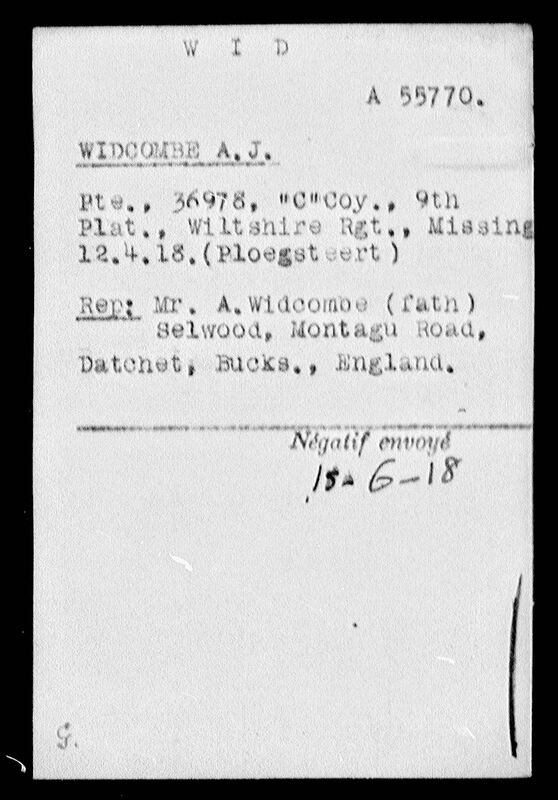 The record card also confirms he was missing on 12 April 1918 at Ploegsteert. In November 1918, the Windsor & Eton Express ran a short article about Arthur and his friends. It was thought that they’d died around the same time but it was only later learned that Arthur had been killed in April. Arthur is listed on Datchet’s War Memorial as Lance Corporal, not Private. We have not yet been able to find evidence of this promotion in the military records which have survived. His father, Arthur Charles Widcombe, remained at Selwood, Montagu Road. He died in February 1942 at Parkside Nursing Home, Upton, Slough. His mother, Agnes, died in 1954. She had been living at Selwood but died at Hitchin Place, Burnham. Arthur’s sister, Elizabeth Mary, never married. She died in March 1963, and had been living at Leven, 35 Horton Road.